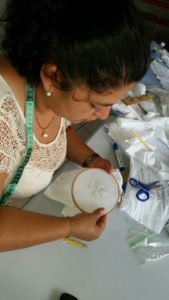 God’s Grace Linens is a micro-enterprise project developed as an opportunity for the women in Honduras to become self-sufficient and to bring support to the Episcopal Diocese of Honduras. The wom en in Honduras who are involved in God’s Grace Linens take great pride in their work, using the gifts and talents God has blessed them with. They are thankful for this opportunity to provide for their families and to support their local church. They are working toward becoming self-sufficient by using their gifts of needlework to make exquisite altar linens at reasonable prices for worship in North American churches. The altar linens are made of fine Irish linen, handmade and embroidered in a variety of designs. A full line is available. Special orders can be placed.